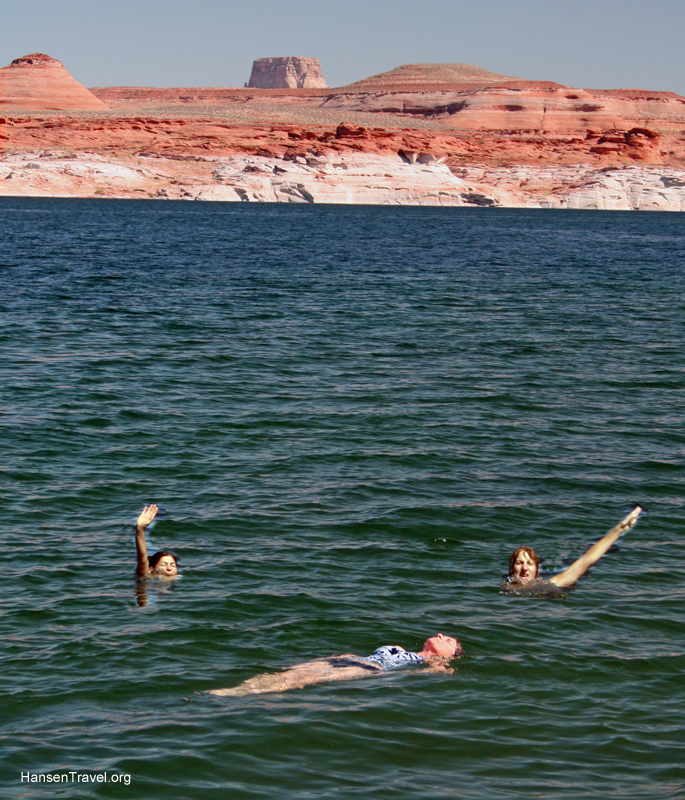 WHY LAKE POWELL: I love the Southwest’s arid, rocky, crisp beauty. 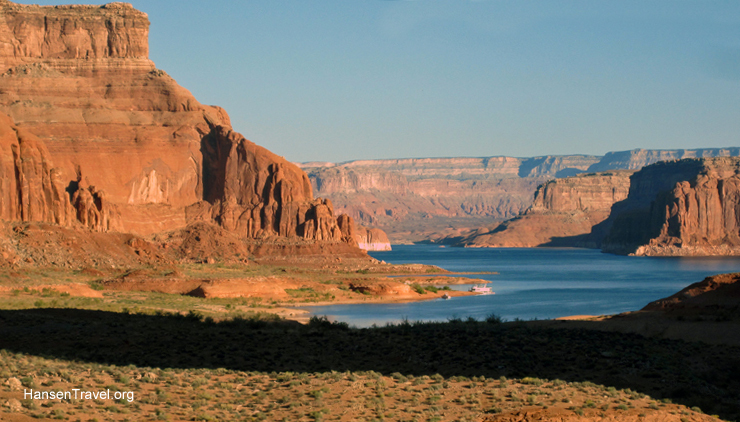 When you combine this with a sky blue lake that stretches as far as you can see, bordered by canyons and cliffs of every imaginable shape and reddish hues, then you have a place called Lake Powell that is hard to beat. 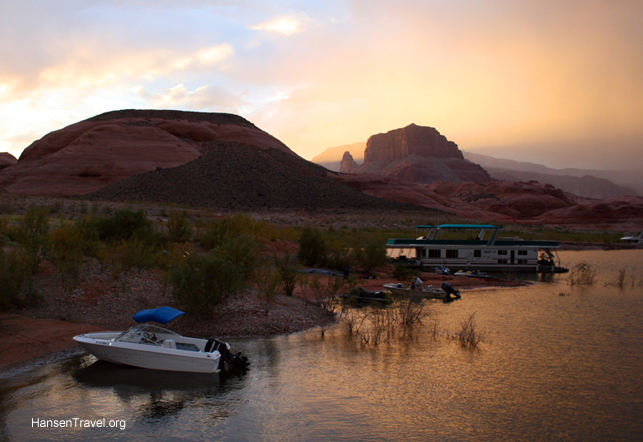 Rent a houseboat and explore nearly 2,000 miles of awe-inspiring shorelines. Stay active all day, if you want, doing watersports or just relax on the houseboat sipping on something nice. WHAT WE RECOMMEND TO DO: Rent a houseboat and all the accessories that appeal to you such as a small motorboat, kayak and / or jet ski. 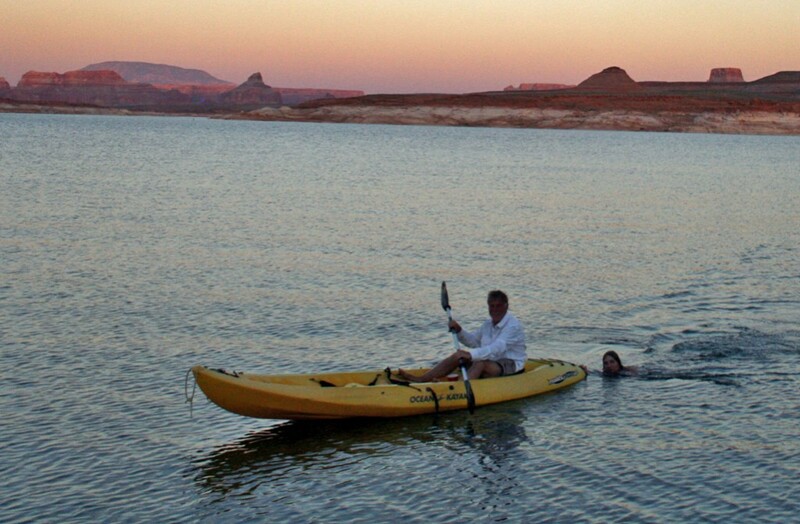 Lake Powell is a paradise for hiking, swimming, water skiing, kayaking, camping and wilderness exploring . The photographic possibilities are endless, too. Lastly, you can make this into a cooking adventure among friends who like to cook. WHERE TO STAY: My main recommendation is to stay on a houseboat for a week. I’ll describe this in greater detail in the following Journal. 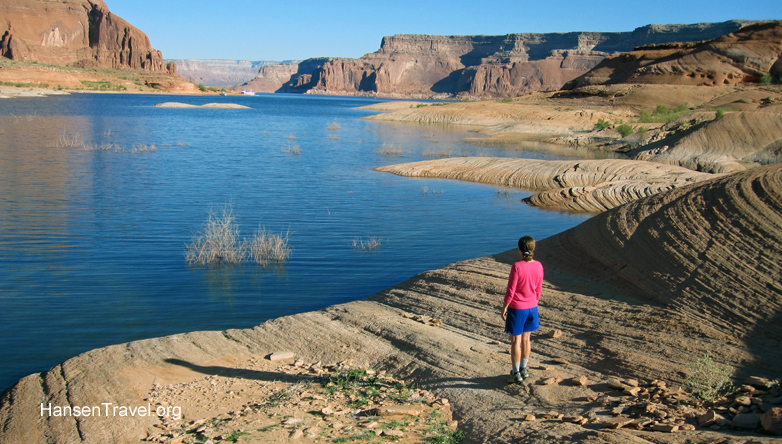 It doesn’t have to be for a whole week, but getting to Lake Powell is a long journey, and it is a huge lake, so one week is barely enough. Alternatively, if you don’t have enough folks to share a houseboat with, you could consider renting a powerboat for a few days and bring camping gear, or perhaps sleep in the boat. 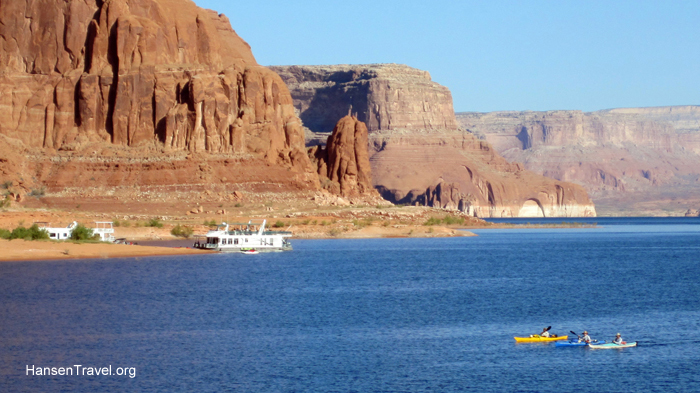 Lastly, there is a nice hotel, the Lake Powell Resort, by the Wahweap Marina (near Paige, AZ) and you could do some day trips in a motorboat and spend the night back in the hotel. TIP: For a reasonable additional cost, you can arrive at Wahweap Marina the day before your houseboat rental begins, and sleep on the boat so you are ready to set sail promptly the next morning at the 10am official departure time. If you wait til the day of your departure, keep in mind that it takes a few hours to unload your vehicle, wheel your stuff down to your boat using the carts provided by the marina, and unload and store all your food and other belongings. Getting all this handled the day before helped immensely. 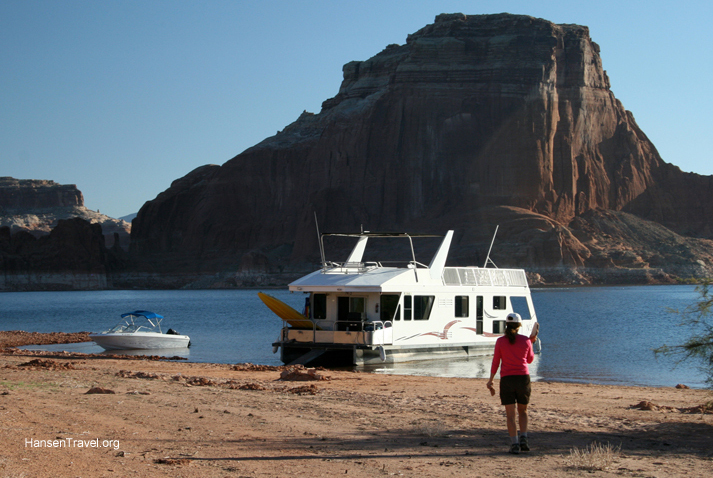 OUR TRIP JOURNAL: For endless years I’ve heard people rave about how great a houseboat trip on Lake Powell is, and after doing this trip for myself, I agree that this is one of the trips of a lifetime. Lake Powell, which is 186 miles long, is actually a man-made reservoir on the Colorado River, straddling the border between Utah and Arizona. It was created by the flooding of Glen Canyon by the controversial Glen Canyon Dam, which also led to the creation of Glen Canyon National Recreation Area. 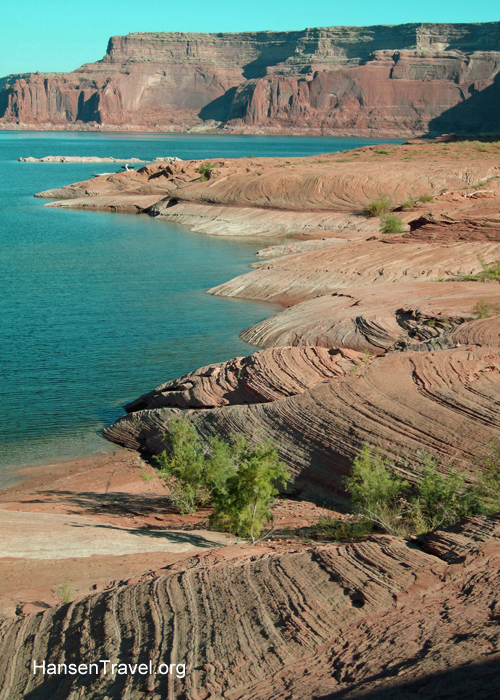 Lake Powell trips start at either Wahweap Marina, in the southwest corner of the lake, near Paige, Arizona, or at Bullfrog Marina, in the northeast corner of the lake, near Bullfrog, Arizona. Houseboat rentals are handled by Aramark, which runs this concession. We agreed on pricing for a package that included our 46 foot Voyager houseboat, 17 foot speedboat and kayak. 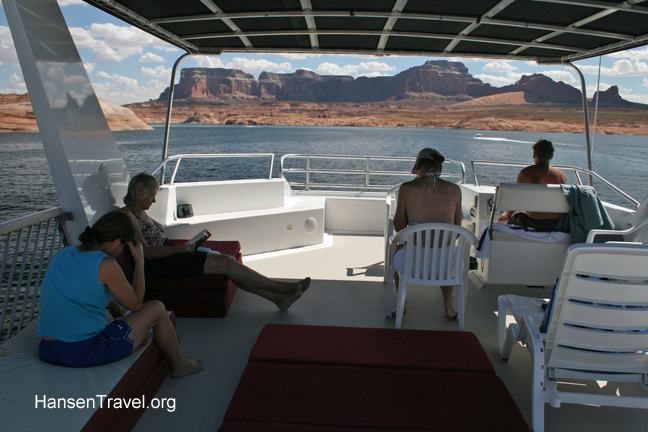 Our cost came to about $1200 per person for the seven days, including all our rentals, transportation to / from Lake Powell, gas for the houseboat, and miscellaneous items. The boat brochure says it can sleep 8 to 12 people, but we felt just right with our two couples and a single person. With larger groups, someone will end up sleeping on the common area/dining room sofabed, and /or sleeping on cushions up top on the deck. The three bedrooms were OK, with modest storage, but you spend little time there. An odd design feature meant that our bedroom at the back of the boat was the only route for people to go outside and up the ladder to the top deck. 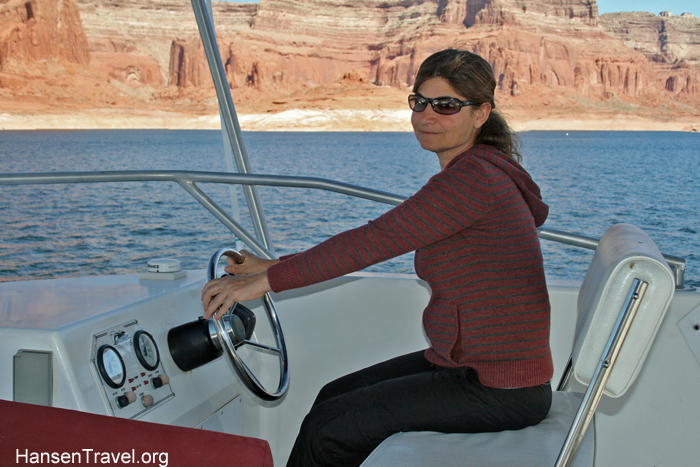 “Driving” a houseboat is quite an experience, but not hard to do. There were two locations from which we could operate our boat: from the main level cabin by the front window, or from the top deck, which is what we chose to do 90% of the time, under the canopy in the fresh air with an expansive view. The boats travel slowly, so going to your next camping spot looks easy on the map but usually takes several hours. Every day, except for one, we moved to a new campsite, so the better part of our days was spent chugging along the lake, searching for next perfect spot. Since no normal person has ever handled a houseboat before, the rental folks provide a thorough get-acquainted session with the designated driver (and anyone else who’s interested) before you’re allowed to leave. Rest easy, it’s not hard to learn. The boat’s water and septic tanks have limited capacities, so you must carefully manage the usage of your fresh water, showers and toilets or else you will be prematurely returning to the nearest marina to remedy this problem. We swam often in the lake, so bathing wasn’t much of an issue. Gasoline consumption was another concern; on the third day out we headed for a small, remote marina which was the only place within many miles to fill up our fuel tanks. 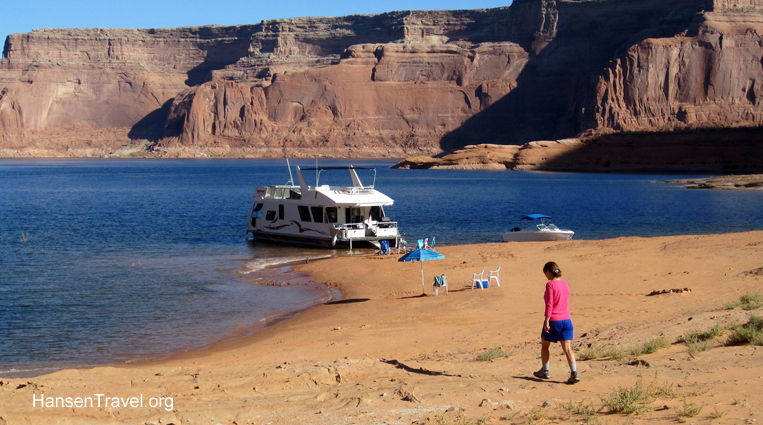 At the modest store we bought a Lake Powell map (very much needed–bring a good map with you), some minnows as bait for fishing, and much-needed ice for the big coolers that came with the boat. Although there was a small fridge inside the main cabin, it doesn’t hold enough food for several people for a week, so you rely heavily on the giant igloo-type coolers and blocks of ice. Making a variety of meals while out on the lake is just plain fun. Fortunately for me, my four companions loved to cook. When the boat was parked (moored) on our chosen beach, we lowered the walkway ramp, set up our camp chairs and then went hiking to see what we could discover in the area. Later, after dinner, we returned to the beach to enjoy our fire and the glittering stars above, the gently lapping waves nearby and the dark silhouetted hills in the distance. You feel the immensity and otherworldliness of the place at such a time. From morning to night we swam in the warm waters of the lake. We chose to visit in mid September because there were fewer people, warm days, cool nights, and still warm water. All this was mostly true. However, the number of boats in the main channels surprised me, and my only minor disappointment was the difficulty we had finding a secluded beach all to ourselves. By four or five in the afternoon, any appealing beach we spotted had already been claimed by one or more boats that had either gotten there earlier in the day, or had remained parked there for a few days. Eventually, we hit on the idea of sending our motorboat ahead to scout for camping locations while we used the supplied marine radios to communicate our findings and to guide the houseboat as needed. 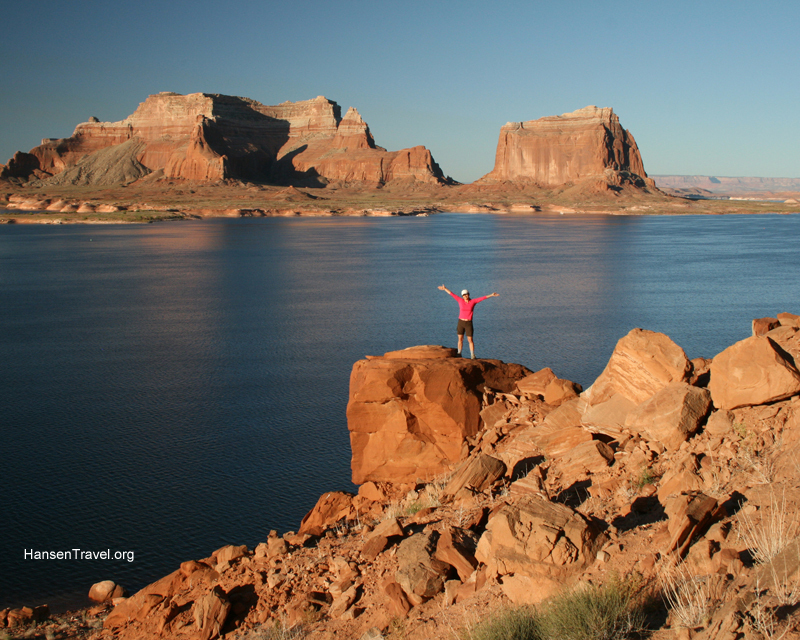 Useful packing ideas: Go to http://www.lakepowell.com/vacation-planning/packing-list.aspx. Some additions to this list: folding beach chairs for sitting around the campfire on the beach; small portable stereo (I brought my Ipod and battery operated speakers) so we could enjoy music on the top deck and the beach (mellow music at a modest volume so as not to disturb our neighbors). You might consider bringing an extra “six day ice chest” which should keep ice longer and be easier to carry around (the boat’s large ice chests are too big and heavy). Parking: At Wahweap Marina there’s a large dirt parking lot, with no shade, where you park your car for the length of your visit. 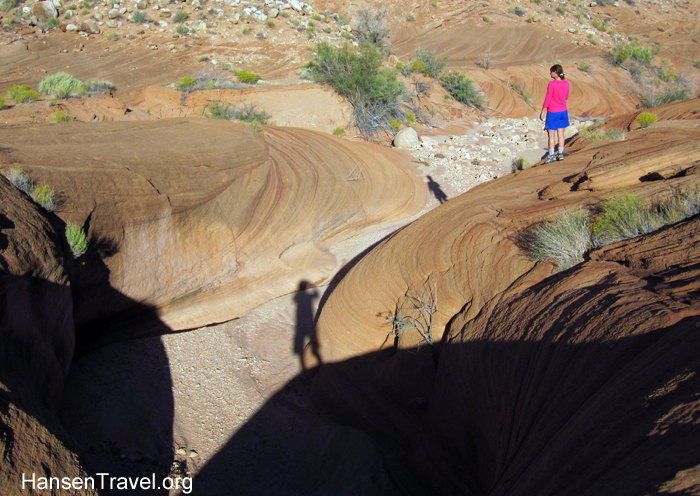 If you are into nature photography, set aside a few hours to visit the nearby Antelope Canyon. This world famous slot canyon is said to be the most photographed canyon in the United States: http://www.americansouthwest.net/slot_canyons/antelope_canyon/. I regret not having seeing this special place since we were so near. Time change: The border of Utah and Arizona passes right through this area, and there is a one hour difference in time zones. Glen Canyon dam is open year round for tours and I recommend visiting it. There’s a nice view of the lake and dam from the back of the visitor’s center, and additionally you can appreciate the design of the arched bridge crossing the river–an architectural marvel.